Dementia involves a range of symptoms that affect the ability to think and remember things accurately. While most people associate dementia with Alzheimer’s disease, it can also be caused by strokes or other issues. Often, family members find it difficult to tell if a senior is simply experiencing normal age-related memory loss or developing dementia. Watch for the following signs your aging loved one may need to be assessed for the development of dementia. Normal senior moments may include briefly forgetting an appointment during times of stress. With dementia, these memory lapses become more frequent, or they may involve needing to ask repeatedly for the same information. You may also notice your loved one forgets things he or she has been doing for many years, such as how to cook a favorite meal. Dementia can be challenging for seniors to manage, but they can maintain a higher quality of life with the help of professional dementia care. Huntington seniors can benefit greatly from the Cognitive Therapeutics Method (CTM), an activities-based program designed to promote cognitive health and delay the onset of dementia. CTM is included at no additional charge with any of the in-home care plans provided by Home Care Assistance. The cognitive changes that occur with dementia may cause your loved one to have difficulty with tasks that require problem-solving, such as paying bills. You may notice stacks of unpaid bills, or your loved one may take much longer to complete tasks than in the past. 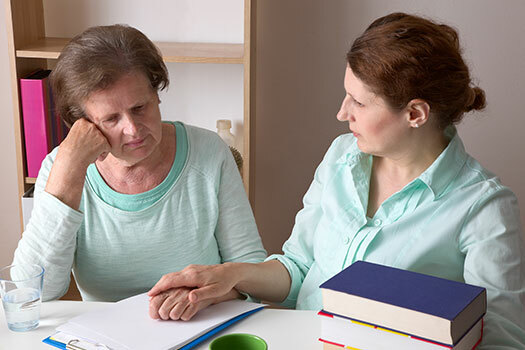 Your loved one may also ask for help with these tasks more often or may try to hide his or her challenges out of the fear of losing independence. Some seniors only require help with a few daily tasks so they can maintain their independence. However, those living with serious illnesses may need more extensive assistance. Luckily, there is professional live-in care Huntington, WV, seniors can rely on. Home can be a safer and more comfortable place for your loved one to live with the help of an expertly trained and dedicated live-in caregiver. Everyone occasionally has difficulty remembering a name or finding the right word to use as they speak. However, you need to be concerned if your loved one suddenly forgets what he or she is talking about mid-conversation or begins to repeat the same thing over again. Seniors with dementia may also use odd substitution words for familiar objects if they cannot think of the right one. Adult children of seniors with dementia are often baffled when their conservative parent suddenly goes on a spending spree or starts consuming large amounts of alcohol. If your loved one suddenly starts doing things that are out of character, consider the possibility that dementia may be the root cause of the behavior. Seniors with dementia are often portrayed as being oblivious of their condition. However, many seniors sense something is wrong. Your loved one may begin to withdraw from social activities if he or she finds it challenging to remember names or carry on a conversation. You may also notice changes in your loved one’s personality. For instance, he or she may become suspicious or accuse other people of stealing things. Some seniors also become anxious, or they may lash out unexpectedly when they get frustrated with a task. While these personality changes can be difficult to manage, you can work with a professional caregiver along with your loved one’s medical staff to develop strategies to ease negative behaviors. Caring for a senior loved one with dementia can be challenging for family members. Families who need help caring for a senior loved one can turn to Home Care Assistance, a leading provider of Huntington, WV, home care. Services available in our customizable care plans include meal prep, mental and social stimulation, assistance with personal hygiene tasks, and much more. Talk to one of our friendly Care Managers at (304) 521-2909 and find out how our revolutionary in-home dementia care plans can benefit your aging loved one.